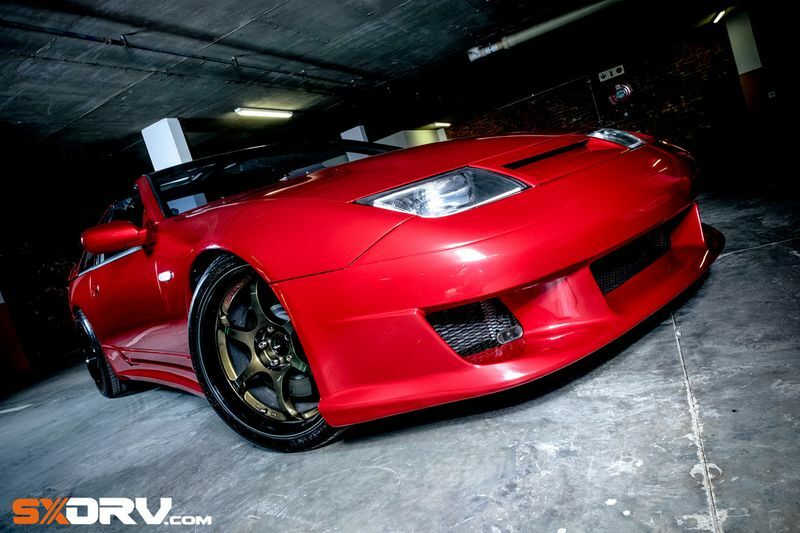 Please meet Callum Orbell and his extremely rare Nissan 300ZX. Let's set the scene... A couple of months back we had an event where the company he works for featured some of their amazing muscle cars. He mentioned his project car and we said cool, bring it along and we'll showcase it along with some of the Japanese vehicles in our stable. Q: Please tell us more about it. Firstly, when and why did you choose a Nissan 300ZX? A: I've always had a passion for 90s Jap sports cars. I guess I fit into the PlayStation generation. About five years ago I was finally able to start looking for one of my dream cars and I was pretty sure it had to come from the Nissan stable. I had considered the Skylines and Silvias initially but an article on the Z32 300ZX twin turbo caught my eye. The more research I did I found that they are incredibly underrated cars, and those that owned them absolutely loved them. I spent the next two years searching for a good example. They were sold in South Africa in 91, 92 and 93 with only 30 ever being sold. I was lucky enough to find an excellent condition one for sale privately in Pretoria from a true enthusiast – and I had to have it. Q: What body modifications have you done? A: I didn't want to overdo the body mods on the car considering it has a beautiful shape that still looks good 26 later. I got the car with all original bodywork, apart from the Tommy Kiara rear spoiler. While driving the car around Randburg, a guy in a Subaru pulled up next to me and said he used to have a 300ZX and still had some parts for it, if I was interested. Amazingly, one of the parts he had was an authentic Abflug front bumper – highly sought after in the 300ZX community. It was in quite a rough state and took me a few weeks of work to get it back into shape. It adds a lot more aggression to the front end of the car and helps with airflow to both the radiator and side mounted intercoolers too. After that, I wanted some side skirts that complimented the new front bumper, eventually, I found a damaged set on eBay from a private seller in Russia. I imported them, fixed them up, and they really look the part. The last body mod was the vented nose panel. That I made myself out of the original piece. It also assists with airflow to the radiator and air intake. Q: Is there a history behind the car? A: There really is. The previous owner bought it as a non-runner and rebuilt most of the car, doing a fantastic job. Unfortunately, after about a year of me owning it, it was stolen in a house invasion. When the car was recovered we found it with a blown motor, damaged bodywork and torn up interior. I spent the next year building a new motor for it with plenty of upgrades, and a further few months to repair the bodywork and interior. I decided from the start of the rebuild that I wanted the car to be better than it was before it was stolen so that there would be a silver lining to that dark cloud in my life. Q: Is it the original paintwork or, if not, why did you choose this colour? A: This is not the original colour of the car. It was a plain gloss red and the previous owner had it resprayed in Mazda MPS pearl red. A perfect choice for the shape of the car if you ask me. Q: How did you come up with the colour of the mags? A: The mags were a matte black when I got them. I've never been a fan of matte wheels as it seems to hide the shape and often looks dirty. I decided something unique and custom was in order, so I went for a two-tone look with a gloss black dish and a dark gold pearl for the spokes, finishing them off with a thin silver pinstripe around the lip. Q: Talking of mags, are they stock? A: Far from it. The stock mags are 16-inch – and that just doesn't cut it by today's show car standards. I went for a 19x 8.5 and 19x 10.5 inch forged wheel, front and rear respectively. Being light-weight and a lot wider than stock, they add a lot of extra grip. Q: Tell us about the engine... As we've seen, it's clearly not standard from the factory, what have you done to it? A: The VG30DETT engine in these cars is either something you love or hate. It is an incredibly tough motor, with some cars in the states running 9-second quarter miles on stock internals. But, it is a very complicated engine with no space to work on in the engine bay, meaning any major engine work often requires removing the engine completely. So, when it was time for me to rebuild the engine, I planned to do everything once so as never to have to remove the engine again. I was happy with the strength of the stock bottom-end, so a brand new set went into a brand new block. The VG blocks have been known battle with cooling on the rear cylinders, so the main water channel was ported out to increase the coolant flow – a mod that has been proven to enhance cooling and reduce detonation in the rear cylinders. As far as the top end goes, these motors benefit hugely from mods that remove the restriction of airflow, especially in the exhaust manifolds and turbos. The heads received a light porting and upgraded valves. Then, extensive work was done the stock exhaust manifolds, porting and extruding them to allow a lot more exhaust gasses to flow. After that was the turbos. I decided to go with a pair of custom built T28S's. Using the stock housings, ported and machined, to take the bigger wheels. That, plus a full exhaust, larger intercoolers, better intake, Nistune software and a WaterMeth kit, completed the build. Q: What figures are we looking at in terms of kW and NM? A: The plan with this motor was never to build a maximum horsepower setup compromising drivability. The choice of the turbos and breather mods actually reduced the lag by about 500rpm and created a very flat torque curve making for an excellent street car setup. the power figures stand at just over 300kw and 650nm on the wheels. Q: Is this a show car or do you race it? A: This is more of a show car and fun street car than a race car. Although that hasn't stopped a few exotics from getting hidings between traffic lights. Q: Is it your daily drive? A: I used to drive it daily before the rebuild but, now with the finish being more show worthy, it mostly comes out to play on the weekends. Q: What was the inspiration for the awesome lighting system? A: The lights were looking a bit too 90s for me so I stripped and rebuilt them. Adding led strips for the park lights with sequential indicators as well as an HID kit for better night-time visibility. Then, I channelled my inner ricer and added some multi-coloured strobes for a bit of fun. Q: We know you have a super-cool job, tell us all about it! A: I am lucky enough to work for Creative Rides. A shop specialising in the sales of classic, exotic and collectable vehicles. I have been with them for a few years now and I mostly look after the vehicles, building and maintaining them. If you love working on interesting vehicles then it doesn't get much better than this! Q: What would your dream car be to work on? A: I've been asked this many times and its a very difficult question to answer. I'm passionate about all interesting cars but, I'd have to say, my favourites are the Japanese tuner cars. It might be a little bit of a cliché, but an R34 GTR NUR2 would be at the top of the list. Q: We photographed the beautiful Charne with your car, how was that for you? A: That was awesome. I've never had the opportunity to do a shoot of this level before, so when SXDRV contacted me to use my car I was really excited. Working with Charne was great as she is a genuine car fanatic. Being so passionate about cars made her the perfect model for a shoot like this. It was a lot of fun! Q: The girls in the office would like to know if you get lots of... er... 'attention' with this car? A: Haha, yes I do, but not always the attention you might think. Most people don't even know what it is but, nevertheless, like the look of it. The attention I usually get is from other enthusiasts who appreciate how rare the car is and the amount of effort it takes to build something like this. It builds a mutual respect between people who share a passion. That matters more to me than trying to impress random ladies. Q: A true gentleman! Any last thoughts or tidbits you'd like to tell us? A: I think that mostly covers it. It has been a labour of love and to build this whole car with my own two hands has been an incredible experience. Through it, I have met new people, made new friends and experienced things I could never have otherwise. And at the end of the day, that's what being a car enthusiast is all about.